the most thermal stable, least expensive dNTP set on the market! 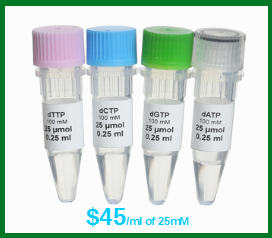 Great for regular PCR such as clone screening, mouse genotyping.Are you still using dNTP from other companies who sell dNTP at ridiculous high price?! Check our the most thermostable dNTPs! 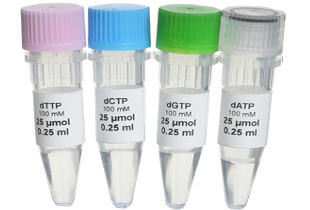 100 mM dNTP aqueous solutions (250ul) at pH 7.0 of each of dATP, dCTP, dGTP and dTTP, each in a separate vial. When you combined vials in the set you will get 25mM dNTP in a total of 1ml. Because the nucleotides are provided in separate solutions, dNTP sets offer maximum flexibility in preparation of reaction mixes for different applications. 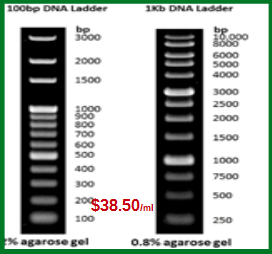 For use in all molecular biology applications, including PCR, long PCR, real-time PCR, high fidelity PCR, RT-PCR, cDNA synthesis, primer extension, DNA sequencing and DNA labeling. 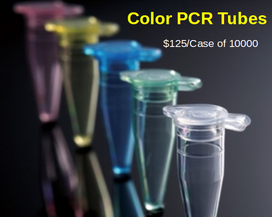 Functionally tested in PCR with Taq and Pfu DNA Polymerases. Greater than 99% purity of each component confirmed by HPLC. Free of endodeoxyribonuclease, exodeoxyribonuclease, ribonuclease and phosphatase activities. The most thermostable and least expensive dNTP on the market! We have developed an innovative way to produce thermostable dNTPs. dNTPs generated by our patented method are much more stable. 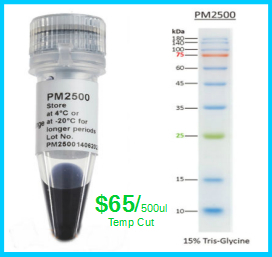 There is no visible change in PCR products after sitting at room temperature (25°C) for 1 month, and 6 months at 4°C. If you are doing PCR at daily bases we recommend you keep aliquot dNTP solution at 4°C. You don’t have to freeze and thaw it every time you do PCR. 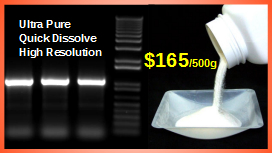 Combined with our thermostable Taq DNA polymerase, you don’t have to set up your PCR on ice. You can set up your PCR at bench top (room temperature) just as you do other regular experiments. Put your ice maker away to save some electricity energy. Reduce pollution, Save our Earth!